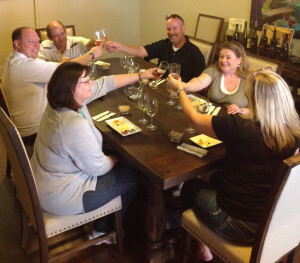 We recently expanded our tasting room by adding a new reserve room for private wine tastings. These tastings are for individuals who want a more in-depth look at our winery with more stories, information, and a more personal experience. You and your guests will sit at a large table in a private room and enjoy a special flight of 6 wines paired with light bites to enhance their flavors. These tastings usually run about 1-1.5 hours and are $20/person and $10 of that fee is applied toward bottle purchase. Copper Club members have a discounted reserve tasting fee of $10. For more information please call 541-993-8301 or send us a message.